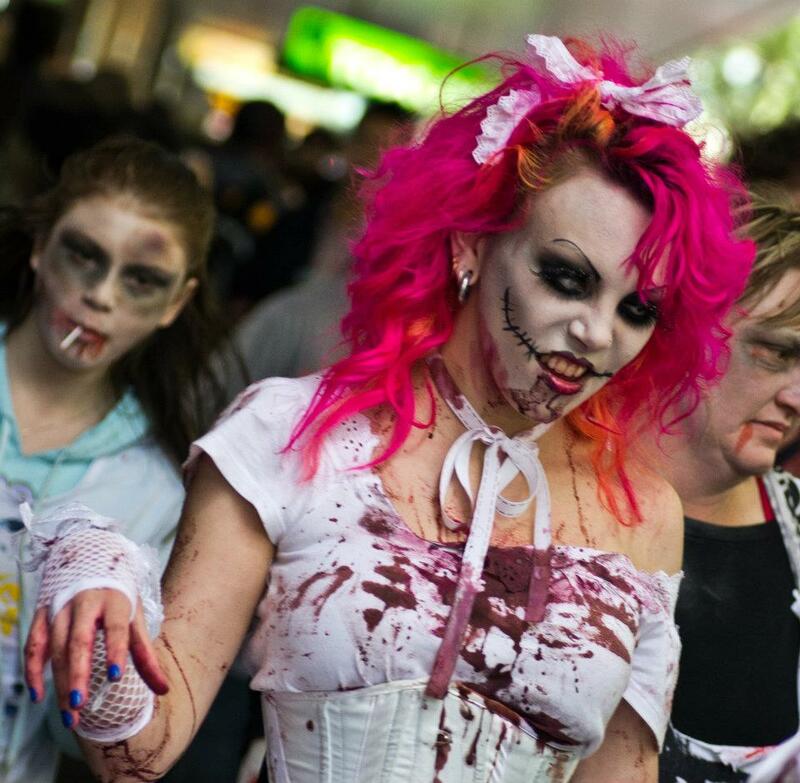 Across cities in the Western world in October, the streets fill with thousands of young people, dripping in blood, shuffling and crying ‘Brains!’ They are zombies, and mimic the undead slaves of Haitian voodoo. This phenomenon, known variously as the ‘zombie march’, ‘zombie walk’, or ‘zombie shuffle’ began in 2000 and has grown exponentially since. Some of the biggest are in Australia where world records have been broken, and zombie participants have numbered at over 10,000. But why do people dress up as zombies and march in the streets? The marches are not officially organised by city councils or other groups, and are not designed as an advertising campaign or political protest. They appear to spring out of nowhere and say nothing, and yet their popularity grows each year. 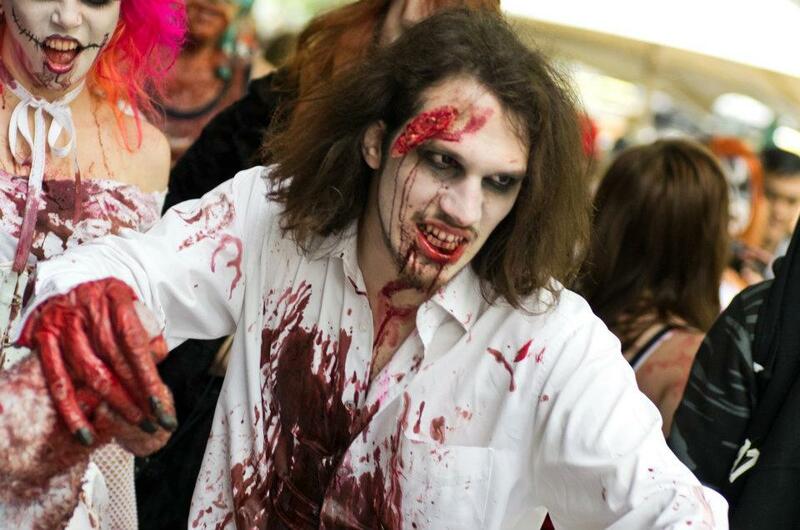 For this reason, zombie walks can be described as a kind of ‘flash mob’. Bill Wasik, a New York journalist, is credited with the invention of the flash mob. He claims to have created the first one as a kind of sociological experiment, to see if he could inspire a group of hipsters to perform a meaningless act in public. Wasik found that there were many young hipsters who did not want to left out, and his experiment changed from a playful joke into a world-wide phenomenon. There was something infectious about creating meaningless disruptions in public spaces, and post 9/11, flash mobs were a welcome relief in an otherwise serious and overly surveilled city. The internet is a vital element in the growing success of flash mobs and zombie shuffles. Months of online planning often go into flash mobs and zombie marches even though their apparition on the street is fleeting. Facebook groups have sprung up around these events, where interested people can discuss costumes, and plan routes. These people have mostly never met face-to-face until moments before the event takes place. I discuss this aspect of zombie walks in a chapter in the book Mediated Youth Cultures (edited by Andy Bennett and Brady Robards), ‘Flash Mobs and Zombie Shuffles’. In it, I assert that flash mobs can be viewed as a form of mediated youth culture that exemplifies the shifts occurring in the ways that we view and use ‘real’ and ‘virtual’ public spaces. It has been argued elsewhere that online communities diminish the importance of the street for young people. However the flash mob cannot exist without its playful performance in the street, where unsuspecting bystanders unwittingly become a part of the show. The dichotomy of on- and offline here is no longer significant. Young people, as digital natives, increasingly live in augmented spaces, where ICTs enhance our experiences of the world rather than replace them. So what becomes of the zombie shufflers after Halloween? The zombie march continues on through platforms such as YouTube and Facebook, attracting hundreds of thousands of views and inspiring creative play. The photos were taken by Gavin Castle at the 2011 zombie shuffle in Melbourne. This entry was posted in Uncategorized and tagged flash mob, Halloween, mediated youth cultures, online communities, space, Youth, youth cultures, zombie march. Bookmark the permalink.